Below is a photo of the Hollande victory celebration in La Bastille Plaza in Paris, historic site of the French Revolution. The text that follows the photo is not mine, but is from a trusted source, and includes a message from his French friend Maxime Lépante. I spoke at an international conference in Paris in 2003 and was told then that 30% of the population under the age of 15 in France at that time was Arab Muslims – and, they didn't come with any plans to assimilate into French culture. 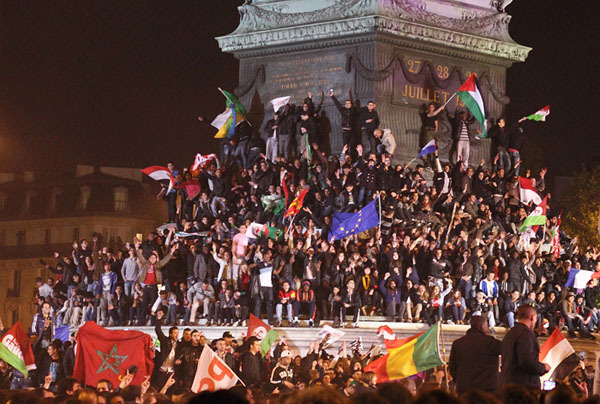 "This photo was taken at La Bastille Plaza in Paris, during the election celebration for the comrade socialist president Hollande. See any French flags? Anywhere? Actually, there is ONE towards the bottom right. The other flags are in order of appurtenance, Palestinian (2 flags top right+1 center left), Algerian, Turkish (towards center), Syrian (towards left of pic + below Palestinian flag), Moroccan (w. star in center), and European Union flag. The other flags I can’t recognize, there are also Syndicates or Unions’ flags. That's France in a nutshell." Marine Le Pen did reasonably well. And with the far-right rising in Greece too, it looks like Europe is increasingly splitting along racial/religious lines, as anyone with half a brain could have predicted. File under: demography is destiny.